To get in touch tweet @CycleIslington, write on our facebook wall, email the coordinator at alison.dines@cycleislington.uk or come along to a monthly meeting. You can email ideas/comments/problems about cycle infrastructure directly to the Cycle Islington Engineering list. Cycle Islington, formerly Islington Cyclists Action Group (ICAG) was formed on the 30th June 1976. ICAG became a part of the London Cycling Campaign (LCC) many years later. Cycle Islington is run by volunteers and works to improve facilities for cyclists and encourage more people to take up cycling. We promote cycling in the community at events during the year. Cycle Islington advocates consideration by all for all on our streets. We meet Islington Council officers almost monthly and the Executive member for Transport 4 times a year. We review major transport schemes and lobby for cycle infrastructure, secure bike parking etc. We publish a newsletter which is mailed out with the London Cyclist, the LCC members’ magazine. Here are the back copies. If you join LCC (and please do join LCC) and live in Islington you automatically become a member of Cycle Islington. If there is anything you’d like to raise anything about cycling in Islington do come along on the second Wednesday of the month at the Town Hall [gmap] at 7.30 – 9.30pm (see events calendar lower down). People that walk, cycle, bus and drive, LCC members or otherwise, are all welcome. The meeting room number is displayed on a board inside the main entrance. We rarely cancel and or change date. All of CI’s activity is coordinated through these meetings. Here are minutes of previous meetings. Got an itch to make Islington a bit better? Think it could be nicer to cycle? Worried about public health? Want to do something empowering, and actually make a difference? Then you’ve found the group for you. There are lots of ways of getting involved. The most precious thing to give is your time; whether that’s two minutes responding to various consultations or a bit longer developing group responses and campaigns, it all makes a difference. We’re also always looking to collaborate with other local organisations, so if that sounds fun, let us know how we could work together. Facebook, twitter and youtube links are in the top right corner. Subscribe by email to the general Cycle Islington list by sending a blank email to CycleIslington-subscribe@yahoogroups.com. There are about 30 messages a month and 180 subscribers and includes Islington Council officers. Subscribe by email to the infrastructure focused Cycle Islington Engineering list by sending a blank email to CycleIslingtonEng-subscribe@yahoogroups.com. There are less than 30 subscribers almost all of whom are on the general list. This is also a superset of the regular monthly meeting attendees. We also post links to larger infrastructure schemes on Islington cyclescape pages to which you can subscribe and comment. Do join the London Cycling Campaign. You will add weight to our voice with council officers, councillors, TfL (Transport for London), the GLA and the Mayor. We organise two or three special rides each year like these. For weekly rides we recommend the Islington Cycling Club. This is North London’s fastest growing cycling club and is unusual as it has a high proportion of female members – so it’s not all testosterone and lycra! The Central London CTC website lists the rides organised by groups and clubs in and out of London. In the middle of Navigator Square, Archway: 4pm-7pm on the third Tuesday of every month. Just turn up but double check their calendar first. Cycle Islington run a monthly workshop from 11am to 1pm on the first Sunday of each month at Sunnyside Community Centre, Sunnyside Rd, N19. Contact Adrian Williams. Tel. 07810 211902. Across the Hackney border Hackney Bike Workshop and Spanner in the workshop hold regular workshops each month. 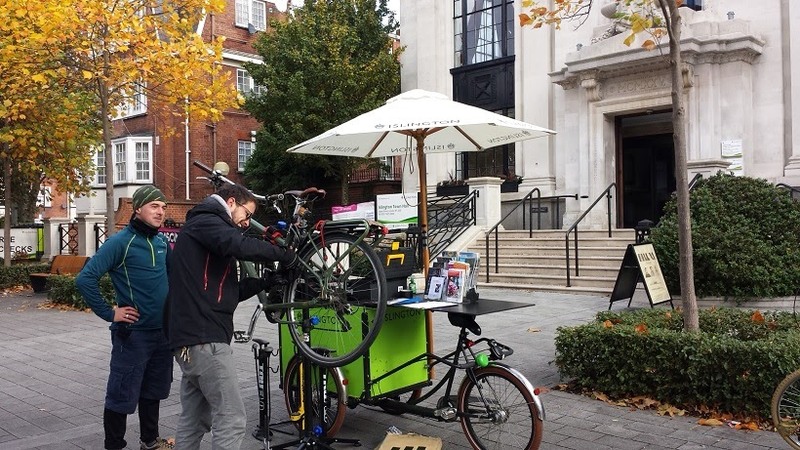 Camden Cyclists also have a workshop at Kentish Town Health Centre on the first Monday of each month except if a bank holiday, check their events page for details. Contact us, what we do, monthly meetings, how we are organised, getting involved, staying in touch, rides, workshops and events calendar.